We did the first stop of my mini-tour for Starry River of the Sky at Books on the Square in Providence, RI. There was a very nice crowd of people, Rain Dragon was surprisingly tolerant and a lovely time was had by all. ahh, my pre-Rain Dragon days feel like a lifetime ago! It's a photo taken 2(?) 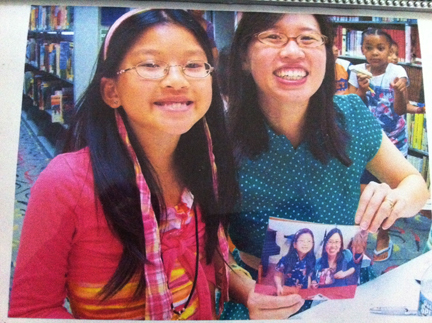 years ago at another event, holding a photo of us at an even earlier event. She took another photo of me holding this photo, which would be a photo of me holding a photo, holding another photo. Did that makes sense? Sadly, I did not take a photo of me holding this photo to illustrate this surreal concept. Regardless, it makes my head turn in more ways than one. I'm always so thrilled and touched when I realize I have readers who are growing up with my books. I love thinking that they have moved from my picture books to early readers and now to my novels! It's these readers, the ones who have really stuck with my books, that make me want to create books to the best of my ability. I don't want to disappoint them!